Download the the Rx Film Cutting Guide from the Downloads page. The watermark will be removed and will have a high resolution. Print out the Guide using a standard inkjet printer and make sure the page layout is set to "landscape." DO NOT scale the drawing to "fit to page." You want to print the guide with "No Scale" so your Rx Film fits correctly within the film cutting guides. After printing, measure the 1" Scale to ensure the cutting guide is the correct size. Place your 8mg or 2mg Film on the cutting guide and use your tweezers or any other object you desire to hold the film in position. Line your razor blade with the lines of the cutting guide, which should be seen through your transparent SUBOXONE® Film. Press down firmly with your razor blade to ensure accurate straight cuts. This will reduce your Film into 8 - 1mg or 8 - .25mg pieces, which you can divide further. Once you cut your film into smaller pieces from the original size, you can take those pieces to the next cutting guide and keep reducing the size. Be sure to line up your razor blade with the lines or your pieces will become uneven the smaller you cut them. 4 - .25mg or 4 - .063mg pieces, which you can divide further. Each of the 4 pieces you've cut above the will now fit into the .25mg or .063mg cutting guide to reduce the sizes even further. This will reduce your Film into 2 - .063mg and 1 - .125mg or 2 - .015mg and 1- .031mg pieces. At this size, you can use the sharp corner of your razor blade to easily pick up and move the small pieces to your daily pill container. For each size film, there is an increment guide which shows you how much of your film is needed for the mg listed to the right. 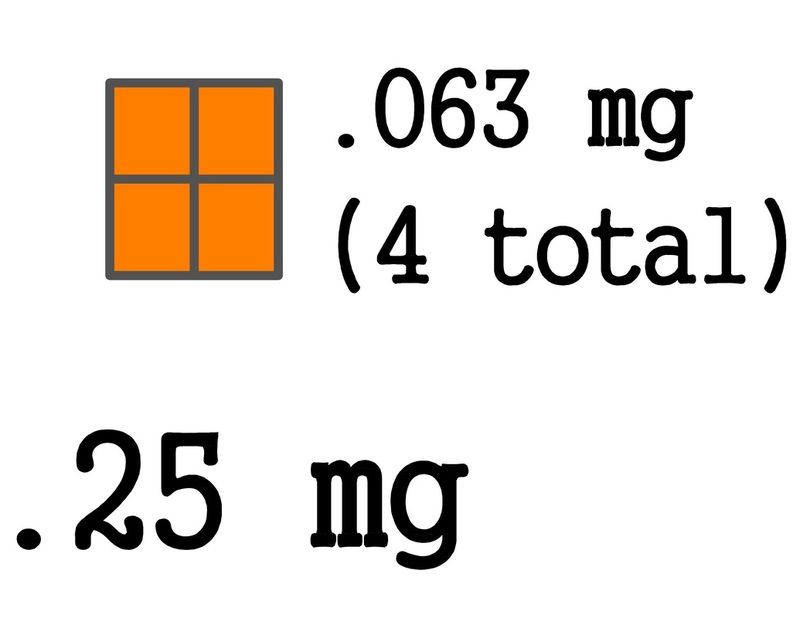 The squares represent the .25mg and .063 pieces. If you reduce your dosage by the increments shown, you'll be reducing your dosage by 5-10% each drop. This will help minimize withdrawals during the taper process due to the increments being so small. Those increments will work for every 1mg or .25mg you're taking. 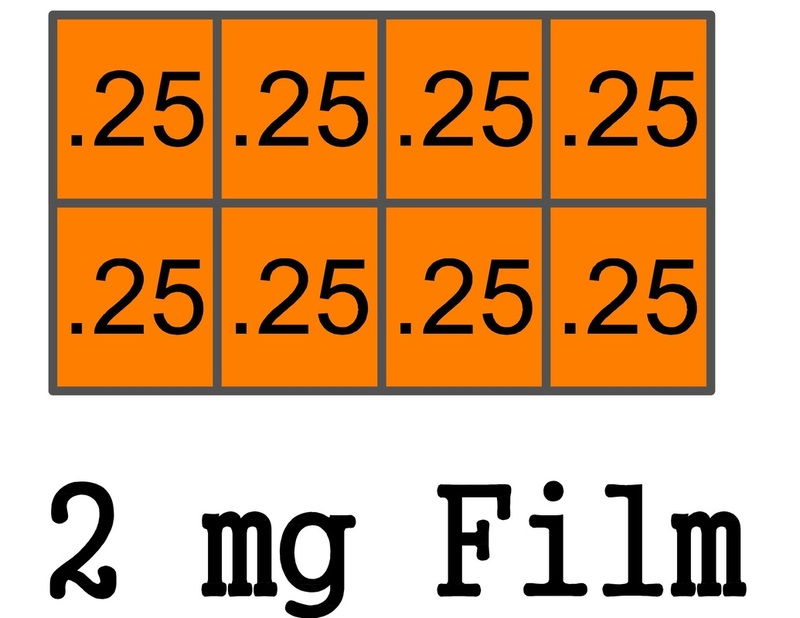 For example, cut your film to the nearest 1mg or .25mg and then add the mg amounts to the right as needed. Use your Rx Film Taper Chart and Calendar to know how long you've been at each dose and the levels of Suboxone in your body. See below for a Suboxone Taper Plan and additional Tips and Tricks! 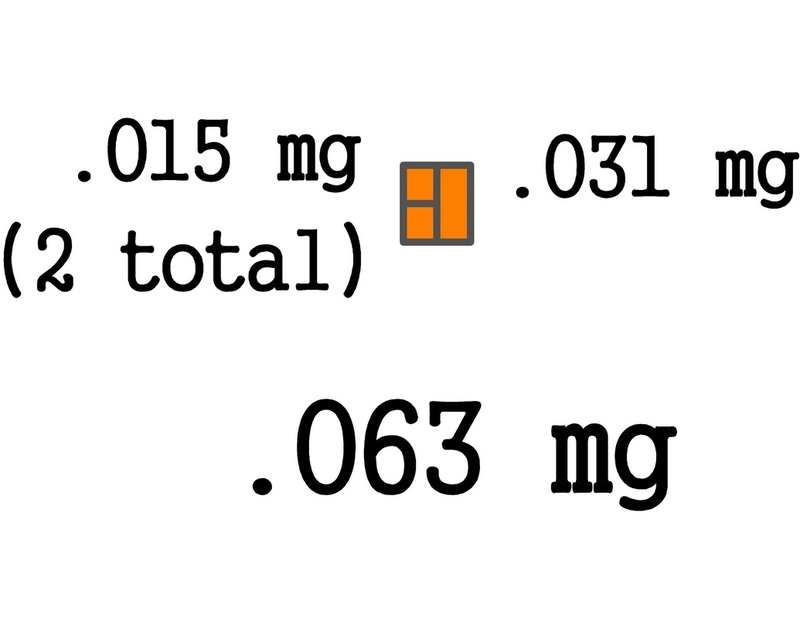 When starting your Suboxone dose at 16 and 8mgs, reduce your increments by 1mg until you get to 4mgs. 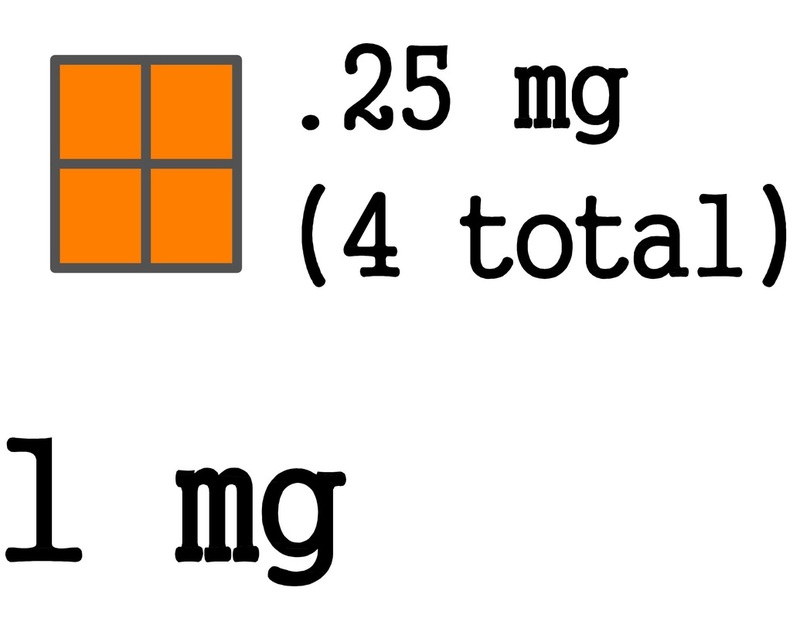 After you reach 4mg, reduce your increments by 0.25mgs until you get to 2mgs. At 2mgs, your body will be more sensitive to the reduction in doses. You'll need to start your gradual taper, reducing by 5-6%. 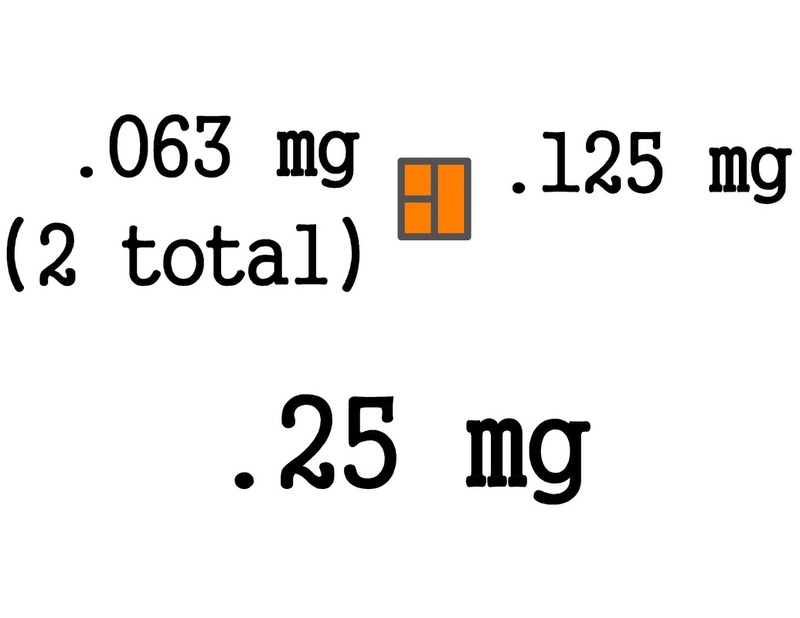 When you're at 2mgs, start reducing your doses by .063mgs, as shown above with the 8mg films, until you reach 0.5mgs. This will result in 24 dose reductions. Remain at each dose for 1-2 weeks. This will slow down the taper process, but the reduction in withdrawal symptoms will be worth it. Once you get to 0.5mgs, it's beneficial to get 2mg films so you can reduce your doses by .015mgs. 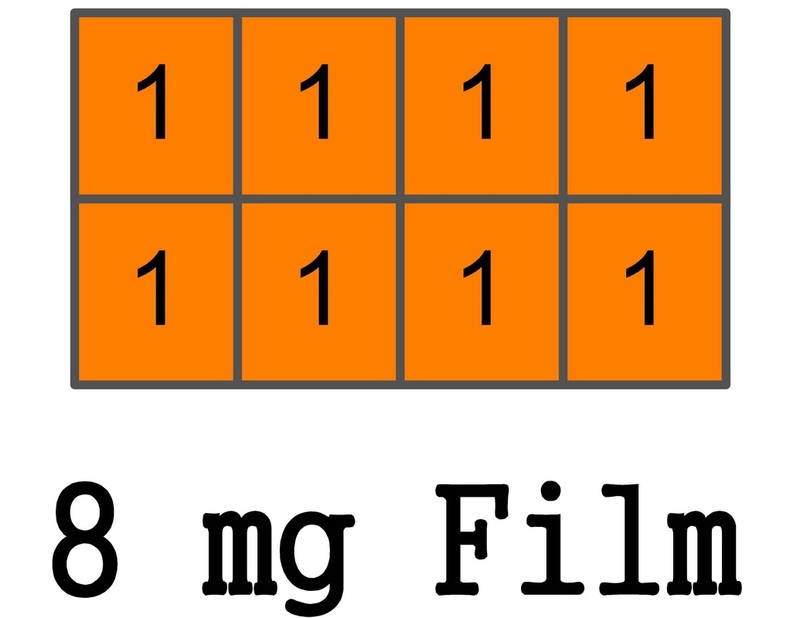 If you're unable to get 2mg films, remain are each dose longer so your body can adjust. Reduce your doses by .015mgs until you're down to zero. By reducing your doses by .015mgs, the Suboxone levels will reduce gradually so you'll never have a large dip in Suboxone levels, which is what causes withdrawal symptoms. This will result in 16 dose reductions. Once you're down to zero, take your dose every other day for 1 week. Then take it every 2 days for 1 week. Then every 3 days for 1 week, which results in only 2 doses. Then take one final dose and your finished! Patience and a thought out gradual taper plan will ensure your withdrawals are reduced, if not eliminated. If you can't wait 1 week between dose reductions, you can reduce the amount of days between each reduction, but if you start to fill the withdrawal symptoms, you should space it back out. The goal is to reduce your doses gradually so the levels of Suboxone in your body is reduced gradually. Download the Rx Film Cutting Guide to start your Suboxone Taper Plan. Everyone is different, so it's up to you and your doctor to plan your taper accordingly. It's very beneficial to create a calender and spreadsheet to properly plan out your taper. You don't want a firm deadline to jump off, but you should keep track of your doses and how long you've been on each one. At higher doses you can jump between mg increments without feeling many, if any withdrawal effects, but as your doses get lower, you should stay at each dose for at least 1-2 weeks so your body can adjust to the reduced dose. As you get below 1mg, I encourage you to stay even longer. The longer you draw out the taper, the more your body will adapt to the lower doses. Dividing your daily dose into multiple doses throughout the day can help reduce the withdrawal symptoms. Exercise and healthy eating help keep your body in peak performance to heal as you reduce your doses. Taking a high quality multivitamin will provide your body and mind with the essential ingredients to repair itself while you reduce your doses. Additional supplements with amino acids will give your body the building blocks needed to help the repair process. The combination of L-Tyrosine and B-6 have been known to help with the healing process of the brain's neurotransmitters which are greatly effected with addiction. Talk to you doctor about getting several prescription medications to help with the RLS (Restless leg syndrome), high blood pressure and sleep when you get to low doses and decide to jump off. Several over the counter medications such as, Imodium, Benadryl, Aleve, NyQuil also help reduce the withdrawal symptoms at lower doses and when jumping off.